I have a wonderful friend who almost died on this day last year. I am so happy to be able to say “almost”. I can’t imagine life without her. This blog is for her but also for everyone else who feels like they are alone and no one else really “gets it”. There are quite a few “almosts” that I know about and when I look at these people, I can not help but think what a horrible shame that would have been. How important they are to this world and those who love them. Myself included. I have also lost so many people in my life to suicide and I’ve had to live my life without them. The pain that death by suicide leaves is a unique pain. It has a unique edge to it. Not only do I grieve their loss but I also grieve for how horrible they must have felt at that time. To take your own life goes completely opposite to all of our ingrained biology. Our body does everything that it can, day in and day out, to keep us alive. To feel so horrible that you can override that is beyond imagination… unless you’ve been there. The last 2 suicides that I heard about both brought public reaction to the centre of my life. Comments such as how “selfish” these people were or confusion as to how they could leave a young child behind (also viewed as selfish) only compounded the grief felt by the families. My very quiet husband actually got angry with a group of co-workers as they discussed the “weak” nature of the last person whom we had lost. He told them how his wife (sweet little ol’ me) had been suicidal for years and to stay for even one extra hour in a day made me the strongest and least selfish person he ever met. At least there is one group of men a little more educated now. Discussing this topic can freak a lot of people out so I am sorry if that is you but NOT discussing it leaves people feeling alone in their pain. I can’t sit by and just pretend it doesn’t exist. So why discuss it now? Well… I have been going through a really hard time lately with many physical issues but also many emotional ones. Christmas was just horrible. I stand there and look at families… my heart is so broken not to have my own. I watch mothers with their young children… the hugs, the kisses, the toys, a visit from Santa… and the loss I feel is almost unbearable. I try to look at what I actually have in my life and I do so successfully but the losses somehow always win out. I’ve had illness after illness since just before Christmas culmination in how I am now with being on a strong antibiotic for one infection, penicillin for 2 others, horrible dizziness caused by pressure in my inner ear and now a reaction to one of the medications. One illness is not nice at all. 5? (I’ve lost count) in a row is so wearing. Add in regular daily pain? Seriously yuck. Then my birthday last week… well… I miss my “friend till the end” Julie on that day terribly. Worse than any other day. And then to top it all off? An unexpected HUGE blow yesterday. Mountain sized blows. I just fell over the edge. I became seriously suicidal again for the first time in over 2 years. All of those skills that I had collected, practiced, and integrated in to my life just seemed senseless again. The people who I am able to help and are always such a huge boost for me but in this state? Even that was not enough. I felt alone. I felt like nothing would ever be right again. I felt that I just could not go on even one more day. Why even bother? I don’t say this to scare anyone, get you worried, or garner sympathy. I tell you because if/when you feel this way yourself? You need to know that others feel it too. That horrible, lonely, nothing matters anyway place is not nearly as empty as you may think. Strong people with great skills can be there too. 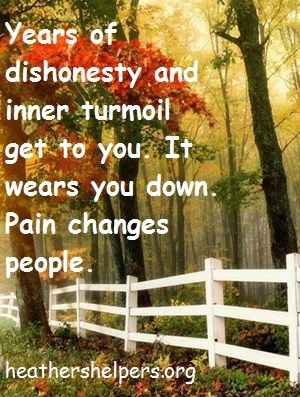 Weakness is never to blame. You just don’t hear about it. No one wants to admit it. I will be honest here. Last night I was lower than I have been in years. If not for my husband and a few friends who were able to read my near silence? I do not know what would have happened. I still feel that way today but I am refusing to allow myself to sink in to total silence and hide away like I always did pre-hospitalization. I will use this moment in time to let others know that even I, the one with all the ideas and advice, can fall back there too. Plus, if I tell you that you are not alone then that means neither am I. You need to take really good care of yourself and keep a decent schedule. Sleep at night, not during the day. If you have medications that you are supposed to take? TAKE THEM. As directed. Self medication of any form is of no help at all. Speak up. It is REALLY hard to admit you feel this way but if I can tell thousands of people? You can tell one or two. Fair? Last but not least? Be gentle with yourself. You already feel totally crappy. Do not add beating yourself up to the schedule. I do not promise to be all happy today, tomorrow or next week. I need to feel how I need to feel and right now that is really sad. I feel lonely because I miss all the people who I have lost in my life. I am back to wondering why my mother and father could not love me. There is no answer other than it was a fault inside of them… but that feels empty to me right now. I want to know why a lot of things had to happen. Once again, there are no answers really. Just acceptance to be found. Again. I will find it. I will ask for and get help finding it. I just want you to know that if you feel this way today, or yesterday or it hits you one day next year, you are never, ever alone and you need to stay here. One minute at a time if that is all you can manage. I posted this last year but I have about 1,000 new readers since then and I’ve been getting a lot of mail regarding the stress people are feeling regarding Christmas. I decided to post this again and I just rewrote a few things. Merry Christmas is almost here to you all. While Christmas and other holidays can be hard for many people, I believe that those with trauma have some extra challenges. That said, I’ve always believed that when you understand something, that issue gets easier to deal with. It rarely takes it away but for me, knowing that something I am experiencing is common amongst trauma survivors helps take much of the pressure off of myself. 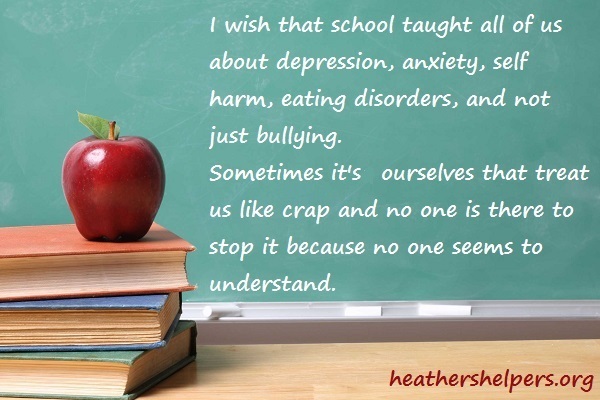 I feel as though I am one sufferer amongst many and that we all coped the same way rather than it is just a “Heather thing”. Here are a few things that you may be dealing with at this time of year. Surviving trauma can have a negative impact on your outlook. Your life feels forever changed. Some survivors deal with anger on multiple levels. Anger at some of the lucky people who have been fortunate enough to have avoided trauma and tell us to just get over it, or it’s our own fault that we suffer. And, paradoxically, we may feel anger at ourselves for having these issues too. It is also not unusual to become angry at the fact that we are angry. Some trauma survivors can feel guilty or shameful because we survived while others did not. I feel this way about my sisters very keenly on holidays in particular. You may no longer feel worthy to enjoy the mundane giving of gifts and time with friends. This is also a time of year where those who struggle with spirituality feel somewhat “force fed” the baby Jesus or other biblical things that happened at this time of year. God seems to be everywhere and not in a comforting sense for many. Trauma survivors are often susceptible to noise. Noises (and smells) can overwhelm us and often take us back to memories or places we would just as soon forget. I tend to choose the furthest chair away from the activity but even then, a cheerful gathering can often still feel very overwhelming. 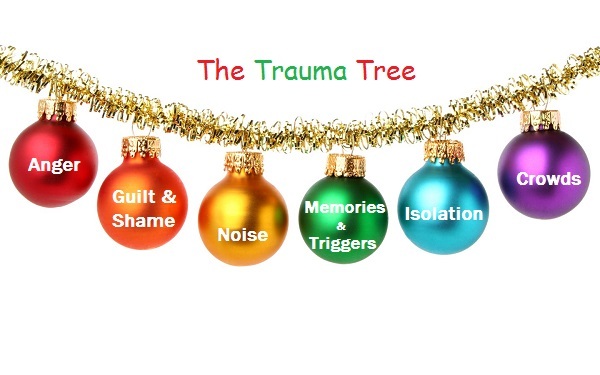 As a trauma survivor, I really don’t want to remember Christmas past. Sitting around while other regale tales of childhood or “the good old days” just makes me want to jump out of my skin. I am truly happy for them. I really am. Hearing it all just reminds me of what I do not understand or have memories of. Add in the sounds, smells, people, the hustle and bustle, money stresses, time crunches, and folks that don’t tend to behave well at Christmas? Well? It all makes me want to hide. You? Major holidays and personal days of importance are days I want to avoid. They tend to heighten the trauma survivors penchant for isolation. Quite often, the people who matter to you are either dead or distant. Often those who you do love and who love you are kept at a “PTSD-Distance” almost against your will. You want to be more open, you want to be more feeling and receptive, but your trauma smothers you. Sometimes the best you can do is just be in the same room with your loved ones, not because you don’t like/love them but because your trauma has crushed your ability to interact the way you used to. If your loved ones tend towards selfishness or they just plain don’t get it, they can make this very hard on you. I know I have painted the holidays as very grim and if this is what they are for you? Please just know you are not alone. The day WILL pass and you won’t have to face it for another 365 days. I prefer to say 365 days rather than 1 year. it sounds longer. You can do some things to help you through the season though. Find out when your local stores are at their least busy and shop then. Where I live that is 6-8pm. You could go bowling down the aisles. PERFECT! Try to take some time to just relax. A day here or there that you do not have any plans will do you wonders. I try to follow busy days with a “do nothing” one. That way, when I start to feel pressured, I can remind myself that tomorrow is a day off. Make life easier on yourself. If that means paper plates, pre-stuffed turkey, going out for a meal rather than cooking it, saying yes to only half of your usual yes events, saying no when you really don’t want to go, if you have a bit of extra cash, let someone else wrap your gifts… whatever it takes to make your holiday easier. If certain traditions trigger you or just remind you of too many hard times, come up with new ones. I never do my celebrating on Christmas Day. That was when my birth family celebrated it. Now we have friends over before Christmas and do our Christmas dinner then. My husband’s family celebrates together several days after Christmas and we can do our visiting on any day. It really helps to switch things up a bit. I think sometimes we all just need to accept that certain days will be hard but head towards them with the knowledge that we’ve lived through them before and will again. Lean on friends that understand and do your very best to have a happy holiday.